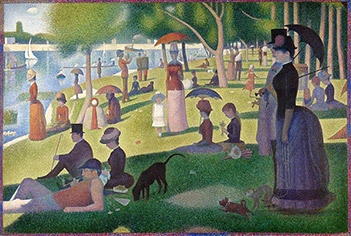 Chicago Shakespeare's Courtyard Theatre will become a life-size masterpiece for Stephen Sondheim's landmark musical "Sunday in the Park with George," inspired by Georges Seurat's most famous work. And I hope you can join me in experiencing it as part of the first IBJ A&E Road Trip. Not only will we see the show—which is rarely staged because of its technical and talent requirements—but we'll also get a backstage tour of Chicago Shakespeare, winner of the 2008 Tony Award win for Best Regional Theatre in the country. Before the show, we'll see the painting that inspired the musical: A Sunday Afternoon on the Island of La Grande Jatte–1884 at the Art Institute of Chicago. You'll also have free time to enjoy the museum and have lunch on your own. And that's not all: There will be prize giveaways, trivia quizzes and more on the ride as well as a box supper served en route home—all in the company of fellow IBJ A&E readers. This day trip has been developed by IBJ in conjunction with Interlude Tours, an established tour company that offers escorted vacations from day trips and short getaways to extended tours worldwide www.InterludeTours.com. For reservation or if you have questions, contact Interlude Tours at 317.913.0387, or reservations@interludetours.com. Cancellation policy: cancellation charges are 65 days or more prior to departure: full refund less $25 processing fee; non refundable less than 65 days out. Tour departs from St. Luke's UMC, 100 W. 86th Street, 46260, at 7:45AM, returns approximately 10:00pm. So will you be joining me...and George?